Long before the city turned the old stone barn in south Lawrence into Fire Station No. 4, it served as a way station on the Underground Railroad, a rest stop for former slaves fleeing north to Canada. Soon, the barn could house a museum celebrating that heritage. The museum proposal was one of two the city received as it ponders the future of Fire Station No. 4, 2819 Stone Barn Terrace, and Fire Station No. 2, 1839 Mass. Both fire stations are closing as new stations are built. The second proposal, for Station No. 2, came from Lawrence resident Matthew Henderson, who proposed buying the building for $128,500 and turning it into his family home. Fire Station No. 4, 2819 Stonebarn Terrace, served as a stop on the Underground Railroad. 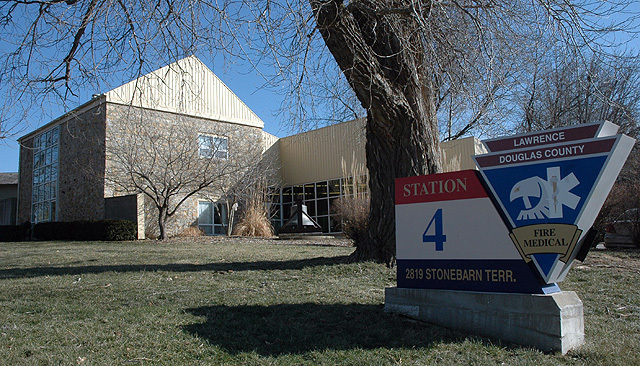 Now, as firefighters prepare to vacate the stone barn that forms the station's core, a proposal has surfaced to celebrate the building's history by turning it into a museum. “The rehabilitation of the property into a single-family residence is the best way of preserving the historical character of Fire Station No. 2,” Henderson wrote in his proposal. Neither proposal came as a surprise, City Manager Mike Wildgen said. “Both of them were brought up during the public meetings we had” to discuss the buildings’ future, he said. The museum proposal comes from the Underground Railroad Association of Douglas County, Kansas, spearheaded by longtime local historians Judy Sweets, Tolly Wildcat and Wayne Wildcat. They said the barn was built in the late 1850s by abolitionist Joel Grover, who in January 1859 sheltered 11 slaves and a newborn baby rescued from Missouri slaveholders, marking the beginning of its life as a station on the Underground Railroad. “It seems only fitting that we honor the Grovers, John Brown and the freedom seekers by telling and interpreting their compelling stories within the very walls where the human dramas occurred more than 140 years ago,” the trio wrote in the proposal. They ask the city lease the station to the association for $1 a year. The association would raise $250,000 to get the museum open by December 2007, with the goal of having a $1 million endowment in place by December 2009. The museum “would be a good investment in our history, as well as bring new tourism dollars to the Lawrence area,” according to the proposal. Wildgen said the City Commission could consider the proposals, along with the future of the Carnegie Library at Ninth and Vermont streets, at a special session March 9.